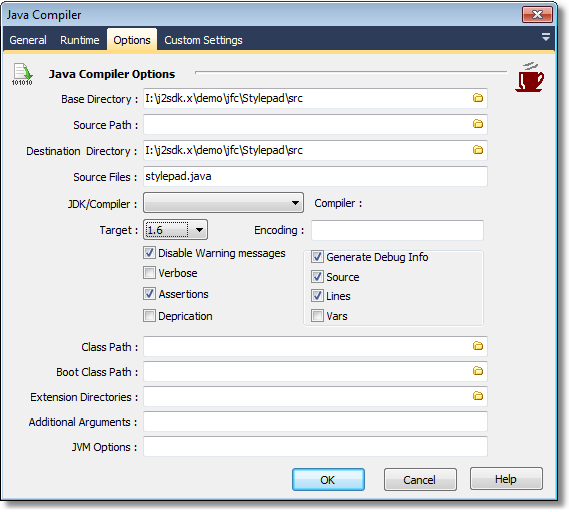 The Java Compiler Action invokes the javac compiler which is included in the Sun Java JDK. It also supports invoking other java compilers such as Embarcadero Java Compiler and IBM Jikes. Base Directory - The current directory when the compiler is invoked. Source Path - Specify the source code path to search for class or interface definitions. As with the user class path, source path entries are separated by semicolons (;) and can be directories, JAR archives, or ZIP archives. If packages are used, the local path name within the directory or archive must reflect the package name. Note that classes found through the classpath are subject to automatic recompilation if their sources are found. Destination Directory - Sets the destination directory for class files. The destination directory must already exist; javac will not create the destination directory. If a class is part of a package, javac puts the class file in a subdirectory reflecting the package name, creating directories as needed. For example, if you specify -d c:\myclasses and the class is called com.mypackage.MyClass, then the class file is called c:\myclasses\com\mypackage\MyClass.class. If not specified, javac puts the class file in the same directory as the source file. Note that the directory specified is automatically added to your user class path. Source Files - One or more source files to be compiled (such as MyClass.java). JDK/Compiler - The JDK Config to use. See the JDK Configuration Section in the Options Dialog (under compilers). 1.1 Ensure that generated class files will be compatible with 1.1 and VMs in the Java 2 SDK. 1.2 Generate class files that will run on VMs in the Java 2 SDK, v 1.2 and later, but will not run on 1.1 VMs. This is the default. 1.3 Generate class files that will run on VMs in the Java 2 SDK, v 1.3 and later, but will not run on 1.1 or 1.2 VMs. 1.4 Generate class files that are compatible only with 1.4 VMs. ClassPath - Set the user class path, overriding the user class path in the CLASSPATH environment variable. If neither CLASSPATH or -classpath is specified, the user class path consists of the current directory. BootClassPath = Allows cross compilation using the bootstrap and extension classes of a different java platform implementation. Additional Arguments - Allows you to pass additional command line arguments to the compiler (ie arguments not exposed as properties of the action). JVM Options - Allows you to specify arguments that will be passed to the jvm when it is invoked. Assertions - Enables support for compiling source code containing assertions. When Target is set to 1.4, the compiler accepts code containing assertions. Assertions were introduced in J2SE 1.4. When Target is set to 1.3, the compiler does not support assertions. Only valid if Assertions option enabled. Deprecation - Show a description of each use or override of a deprecated member or class. Without -deprecation, javac shows the names of source files that use or override deprecated members or classes.